Today’s Powershell example is something that I know I will re-use, so I wanted to put it in a place where I could always find it, i.e. on my blog. The main purpose of this example is to show how to route output from a cmdlet to a formatted or “pretty” output, such as as CSV File that can be opened by a spreadsheet such as Excel, a Powershell Grid, or an HTML file that can be opened by your favorite browser. If you create HTML to a string variable, instead of a file, it can also be used to send as the body of an email. The second purpose is to put in one place all the common options for getting files from some disk/directory structure (using Get-ChildItem). Hopefully, I have taken information from 5 or 6 sources and condensed it down to one source; with comments of what you can tweak and change as needed. #simple take cmdlet and route to CSV (your choice of whether to -Append or remove it to replace). Here’s his download link. 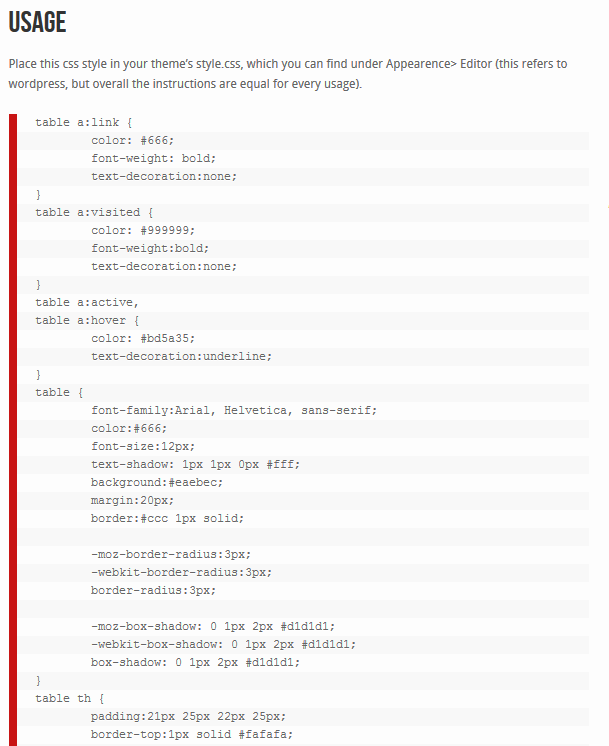 You can download his code, and take out everything in the HTML style tags, and save in htmlStyle2.css. The parm to the -CssUri (in my code above) is on the ConvertTo-HTML cmdlet). I use $($PSScriptRoot) so that it can find the file in the current directory where the .ps1 file is running from (rather than needing to fully qualify the file with a hard-coded directory name). Note: that the ConvertTo-HTML command does not include the THEAD and TBODY tags to be included. So if you find a stylesheet that uses them you may have to tweak it a little (or use RegEx to insert them into the file in the proper places). I experimented with some stylesheets from this site: 40 Free Beautiful CSS CSS3 Table Templates, but I was not having luck getting them to work. Here is the CSV data in raw format. CSV of course stands for Comma Separated Value. "C:\Demo\Demo1.txt","12","2/2/2015 10:25:50 AM","2/2/2015 10:25:50 AM","2/2/2015 10:25:59 AM","False","Archive","C:\Demo",".txt","abc\neal.walters"
"C:\Demo\Notes.bak","12","2/2/2015 10:48:09 AM","2/2/2015 10:48:09 AM","2/2/2015 10:25:59 AM","False","Archive","C:\Demo",".bak","abc\neal.walters"
"C:\Demo\Notes.txt","12","2/2/2015 10:26:03 AM","2/2/2015 10:26:03 AM","2/2/2015 10:25:59 AM","False","Archive","C:\Demo",".txt","abc\neal.walters"
"C:\Demo\ReleaseNotes.txt","110","2/2/2015 10:26:18 AM","2/2/2015 10:26:18 AM","2/2/2015 10:26:41 AM","False","Archive","C:\Demo",".txt","abc\neal.walters"
"C:\Demo\SubDir\Demo2.txt","12","2/2/2015 10:44:18 AM","2/2/2015 10:44:18 AM","2/2/2015 10:25:59 AM","False","Archive","C:\Demo\SubDir",".txt","abc\neal.walters"
If you don’t need to export the data to another program, then the Out-GridView might be all you need. It also has the ability to sort and filter data. Filtering is available when you click the “Add Criteria” button. This allows you to interactively “play” with your data. click any column title to sort. For a really fast filter, just type in the box at the top that say in light gray on white “Filter“. This searches the entire row for the raw text you type in. So in my case, I could type .bak, or “SubDir” to quickly limit the output to a certain row.